If you are wondering whether you should buy a home now or wait, you have come to the right place. For our newer readers who have simply stumbled across the Tallahassee Real Estate Blog, you might expect this to be the typical "now is the time to buy a home" spew you would normally expect from "real estate professionals", but I suspect you'll be pleasantly surprised that this is not the case. For those of you who have been here before, you know that this will not be an opinion piece, rather it will be an examination of current market trends backed by the experience of a real estate broker who has been in the business for more than 20 years. And that brings us to the most important question on the minds of homebuyers today ... should you buy now or wait? So why are you thinking about buying a home? Unlike any other major investment, buying a home is not primarily an economic decision. We often move for reasons that have nothing to do with money, but I strongly recommend that you always review the financial impact on your long-term goals, even if they do not end up being the primary focus on which you make your decision. 1. Own here, moving here - This is the largest of all four groups which we typically find coming to our office to buy a home in Tallahassee. They own a home in Tallahassee, and they are thinking about "moving up," or "down-sizing." My advice differs based upon the reason for the move. If you are down-sizing, now might not be the best time to move financially. Of course, my advice is to move if you really want to move, but if money plays a big part in it, know that your "big" home will likely appreciate at a higher amount than the "smaller" home to which you want to move. However, if your current home is worth more than $500,000 though, that might not be the case as we addressed in this article on high end homes in Tallahassee. Now if you are moving-up, the opposite is true. Your "small" home will appreciate at a lower amount than will your "larger" future home. 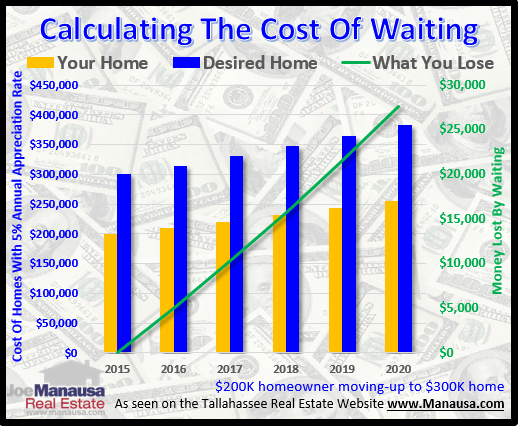 So many people who own a home in Tallahassee are "waiting" for their home values to return before they buy the next home. Financially, this is a huge mistake if you are a capable move-up buyer. The graph below demonstrates this well. The graph above uses an example of somebody who lives in Tallahassee in a $200,000 home who wants to move to a $300,000 home (a typical homebuyer moves-up 150% in home value). Assuming Tallahassee enjoys a 5% annual appreciation rate over the next five years (expected to be a bit higher due to the collapse in the past), the gold bars show the current home's value each year, while the blue bars show the desired home's value each year (both measured on the left vertical axis). The green line shows the difference in the amount of money gained through appreciation between the current and desired home, so the longer a move-up buyer waits, the more it will cost them. So if you want to move-up but were hoping to get more equity out of your home when you sell, then waiting seems to make sense. But not if you consider that the home that you will purchase is appreciating too! If you are in this boat, drop us a note and we'll schedule a time to review your situation and help you discover a way of making your best decision. 2. Rent here, moving here - If you belong in this category, you are basically the same as a move-up buyer with one additional consideration ... lifestyle. Are you currently renting because you might not be in Tallahassee much longer? Are you renting because you like the freedom of not being tied-down to one place too long? Being a tenant is a sound decision if Tallahassee is just a brief "stop along the way" for you, as there are costs associated with buying and selling a home that take some time to recover. But if you have been renting solely to wait until there was a great time to buy, wait no longer. Take a look at the best homes for sale today. Values are starting to rise, so the longer you wait, the more you will pay. Interest rates are near the all-time low, and they are you're biggest "need for speed" right now. You can likely buy for much less monthly payment than buyers will see in the coming years. So the bottom line for this group is keep renting if it best supports your lifestyle, or buy immediately otherwise so that you can take advantage of low prices and low mortgage interest rates. 3. Own elsewhere, moving here - This group often wants to own, but occasionally prefers to rent for the first year in order to get a better feel for the Tallahassee area. Normally, I think this is fine. But today's market conditions are just too good for homebuyers to wait. Home prices will be higher next year, and the cost of money will likely be higher as well. It will very likely cost this group too much money to take a year-off to rent ... and that doesn't even consider the additional cost of making an extra move. My advice to this group is two-fold. First, if you know you'll be in Tallahassee at least three years, you should strongly consider buying immediately (less than three years will typically justify leasing so that you don't lose money on the costs associated with buying and selling ... closing costs). Secondly, take the time to hire a real estate company that you know that you can trust. Research online and then interview until you find one that will lead you to where you would lead yourself if you new Tallahassee better. Our experienced buyer's agents are well trained, prepared, and equipped with all the right questions to ask you to ensure that we help you move to the best destination for you in Tallahassee. 4. Rent elsewhere, moving here - Unless you know that Tallahassee is a long-term destination for you, consider renting at first. Economically, this will make sense if you move to another area within the next few years. If you do not have experience as a homeowner, it is best you gain that experience in an area you expect to live for five or more years. 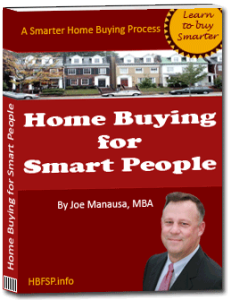 This extra margin of time will help you overcome any mistakes you make when buying a home (typical for first time homebuyers who fail to secure a great real estate company to help them). If for some reason you know Tallahassee will be a long-term stop on your life's journey, don't be afraid to follow the advice given for the group above. Renting first and then buying later will cost you an additional move, money that could be spent better on the furniture and fixtures you'll want to put in your home. Regardless of your 'buyer type,' you would be wise to first meet with a real estate buyer's agent. Let a real estate buyer's agent discover your unique needs and wants, and then discuss the opportunities in the market with them. We often times meet with people who choose to rent now instead of buying, but they want to be armed with the most accurate, most current market information and advice before they do so. If you are planning a move in or to Tallahassee, simply drop us a note and we will reach out immediately to help you along your way. How Often Will A Home Seller Counter?